Judy Polan: ODD BITS: Architects unite in campaign to save "Russia's Eiffel Tower"
ODD BITS: Architects unite in campaign to save "Russia's Eiffel Tower"
Prominent architects from all over the world have joined in writing an open letter to Russia's President Vladimir Putin, asking him to prevent the scheduled demolition of a singular construction that's been dubbed "Russia's Eiffel Tower". 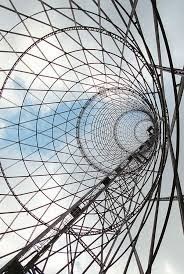 The 160 meter-tall Shukhov communications tower in Moscow, a 50-story structure of steel latticework, is noted for its light weight relative to its height, and for its clever use of linear elements to create non-linear spaces. It is considered to be one of the greatest engineering feats of the 20th century. 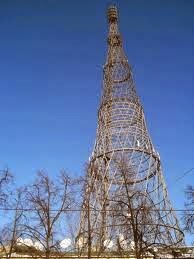 Completed in 1922, Shukhov Tower was designed to facilitate the spread of Soviet-era Communist propaganda. The historic structure is said to have inspired architects and designers from LeCorbusier to Sir Norman Foster. Influential designers who have recently signed the petition include Tadao Ando and several other Pritzker Prize winners; Elisabeth Diller of Diller Scofidio + Renfro, the firm that is currently undertaking the expansion of MOMA NY; and William Baker, the engineer of Burj Al Khalifa in Dubai, the world's tallest building. The group, led by Vladimir Shukov's great-grandson, is campaigning for the structure to be nominated for the UNESCO World Heritage List. To read more about this, link here to an article in the March 19 issue of the Guardian newspaper. 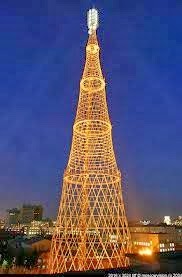 Mr. Putin, DON'T tear down this tower!